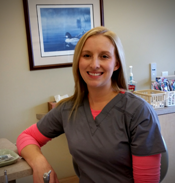 Our Staff is committed to providing our patients with high quality dental care in a caring and friendly environment. Eric, a 1985 graduate of Forest Hills Central and graduate of the University of Michigan Dental School, has been practicing general dentistry since 1993. He is a member of the American Dental Association and the Michigan Dental Association. Since moving from his northeast Grand Rapids office in 2004, he has only watched his practice grow and is pleased to provide so many people with the latest and most innovative treatment. Eric is married and Father of two. He enjoys hunting, fishing and being outdoors in his free time.